New Hampshire is a proper noun. New Hampshire is (1) a state in New England; one of the original 13 colonies, (2) one of the British colonies that formed the United States. The following articles provide more information about the term New Hampshire. The New Hampshire state capital is Concord. 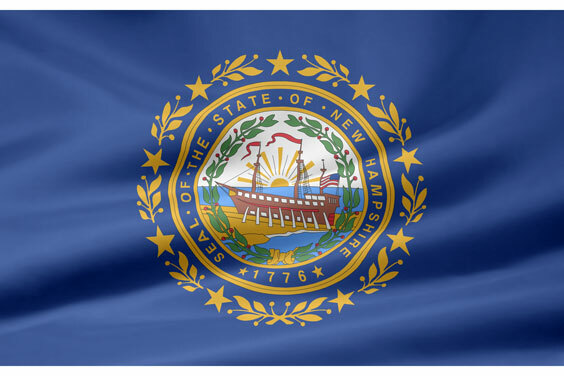 Learn about New Hampshire's state government, including its branches and operations. Find New Hampshire travel and tourism information, and read about living and working in the Granite State. Learn about urban, suburban, and rural real estate markets in New Hampshire. Real estate agents, buyers, and sellers will appreciate the New Hampshire real estate resources on this page. New Hampshire state history, geography, and travel information are the subjects of this New Hampshire atlas page. This National Park directory page lists National Parks, Historic Landmarks, and Natural Landmarks in the State of New Hampshire. An interactive New Hampshire map, plus photos and highlights, are included thereon. UNH, located in Durham, was founded in 1866. It is the largest school in the University System with about 13,000 students altogether. UNH is a land, sea, and space-grant institution. There are 600 faculty members. Graduate programs are available in most of the disciplines at UNH including an interdisciplinary Master of Liberal Studies program. The following articles provide recent New Hampshire-related news. ABC News. Wednesday, 24 Apr 2019 18:27:42 -0400. Newsmax. Tuesday, 23 Apr 2019 13:30:46 EDT. Sydney Ember and Astead W. Herndon. New York Times. Tuesday, 23 Apr 2019 02:46:35 GMT. Jonathan Easley. The Hill. Monday, 22 Apr 2019 17:33:23 +0000. Show Us Yours: Disney's Great Movie Ride doesn't exist anymore, but Don from New Hampshire pays homage to it with his Shooting Star Theater. David Carnoy. CNET. Sunday, 14 Apr 2019 15:32:42 +0000. ESPN. Wednesday, 10 Apr 2019 17:27:31 EST. Washington Times. Thursday, 04 Apr 2019 01:00:54 -0400. CBS News. Tuesday, 26 Mar 2019 01:05:39 +0000. The following digital image illustrates the term New Hampshire.